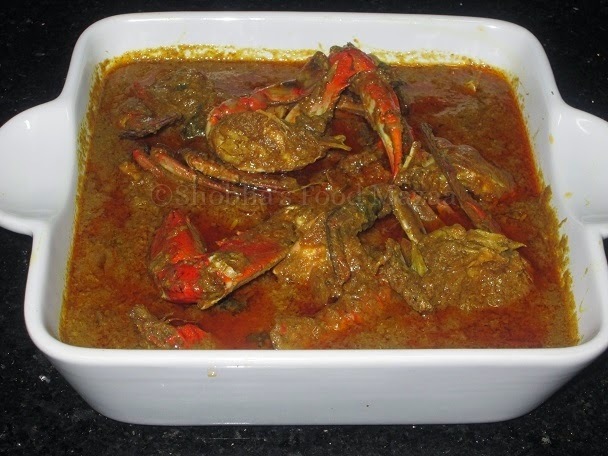 Making crab curry was on my list since a long time. At last I got some crabs though they were not really big, still the curry turned out awesome. I made it in the Goan style and served with plain rice. This gravy can go with dosas and appams too. Cleaning the crabs is little tricky. If you get them cleaned and ready from the market it is fine .. or else you can watch this video of Vahrevah Chef how to clean them. I just followed his instructions as this was my first attempt too. 1. Clean the crabs and cut them into pieces. 2. Marinate them with salt, little turmeric powder and lemon juice. 3.In a pan heat 1 tbsp oil and add the fennel seeds, cumin seeds, red chillies, cardamom, cloves and cinnamon. 4. When they leave out an aroma tip in the onion and saute it adding the ginger garlic after a little while. 5. Now add the grated onion and stir fry for a minute. 6. Grind it adding water to a thick paste. 7. Now heat oil in a pan and add the finely chopped onions. Saute. 8. 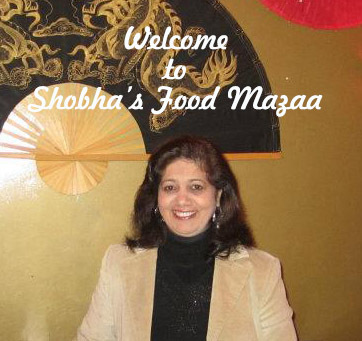 Add the tomato cubes and the spice powders except garam masala . 9. Tip in the marinated crab pieces and stir fry until they change the colour for about 2 minutes. 10. Now add the ground masala paste, curry leaves and salt. Stir fry for a few minutes. 11. Add one and half to two cups of water and simmer to cook for about 15 minutes. 12. Finally stir in the coconut milk and garnish with coriander leaves. I never would have thought to put crab in a curry, but it sounds delicious. 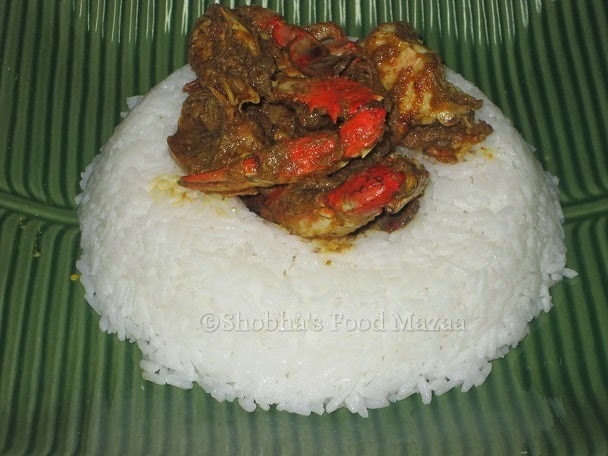 crab curry looks delicious thanks for sharing with Hearth and soul blog hop. pinning.